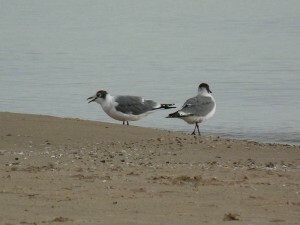 The 2 American Avocets found this morning (May 28) at Montrose Beach were still there as of 4:30 p.m. Both birds were in the fluddle just west of the beach house. 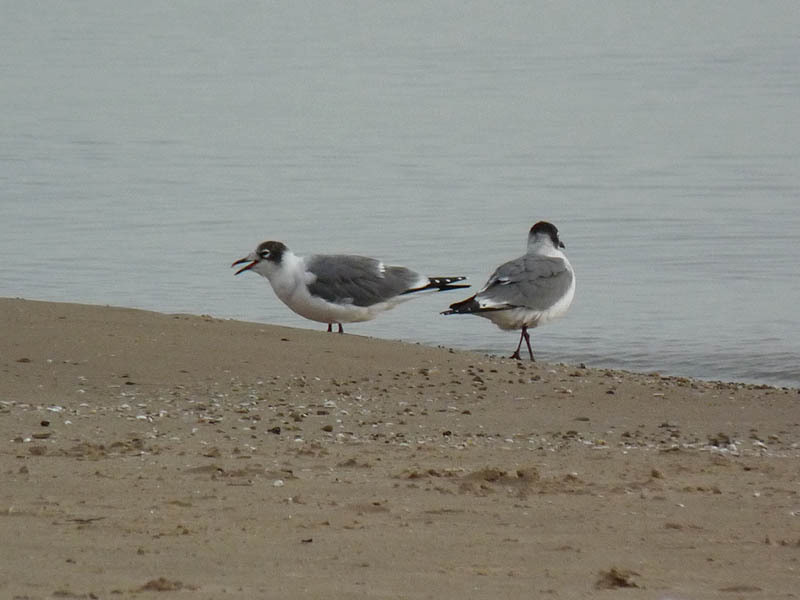 I also had an adult Laughing Gull in the fluddle in the same area as the avocets. A couple kids flushed the bird but it relanded and joined a group of Ring-billed Gulls near the volleyball nets. This entry was posted in Spring Bird Reports and tagged American Avocet, Gulls, Laughing Gull, Shorebirds on May 29, 2016 by rhughes. 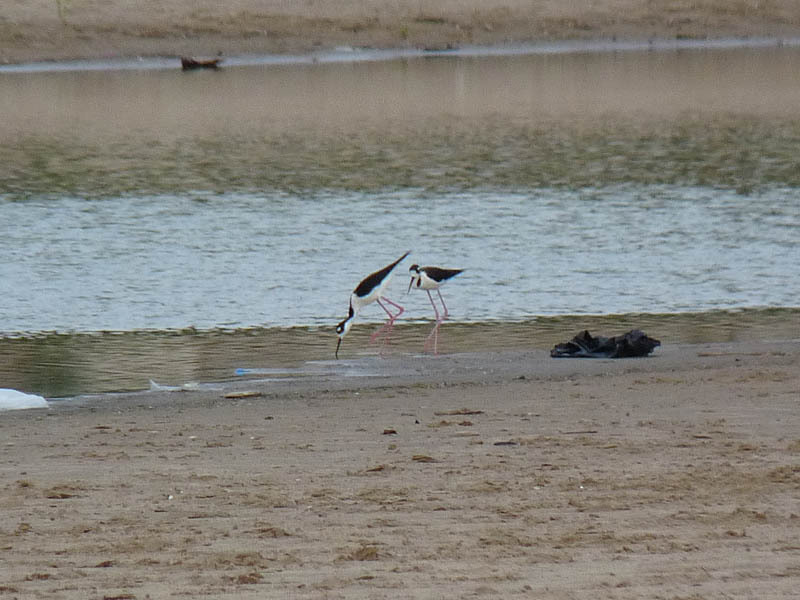 The 2 Black-necked Stilts seen on May 27, 2016 represent just the second record of this species for Montrose (the first occurring in May 2015). Black-necked Stilts have been moving north for a couple decades and now breed in Illinois, so the recent sightings from Montrose aren’t surprising. This entry was posted in Rare Birds, Spring Bird Reports and tagged Black-necked Stilt, Shorebirds on May 28, 2016 by rhughes. I spent a couple hours at Montrose this morning, May 27. Most of the passerines from earlier in the week must have flown north with the south winds, which isn’t surprising. The waterbirding however was much better. Two Black-necked Stilts and 2 immature Franklin’s Gulls were on the beach early in the morning. 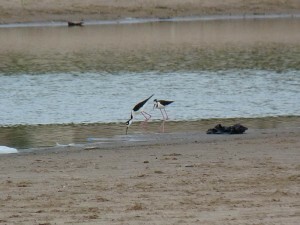 The stilts were in the fluddle on the beach, working west and feeding along the way. They flew to the east and disappeared after a little while. 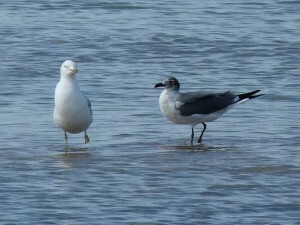 The Franklin’s Gulls didn’t stay long either. Black-necked Stilt is an accidental species at Montrose, with just one previous record. The real excitement came when a group of Double-crested Cormorants flew over that contained a noticeably smaller cormorant. We could tell the bird was brownish, so it was probably an immature, and based on size likely a Neotropic, a species unrecorded at Montrose. The bird was too far away and the flock was moving too fast to make out any other plumage features. I’m not going to add it to the list of birds seen at Montrose because of the distance involved but I think it was a Neotropic. This entry was posted in Rare Birds, Spring Bird Reports and tagged Black-necked Stilt, Franklin's Gull, Gulls, Neotropic Cormorant, Shorebirds on May 27, 2016 by rhughes. Montrose isn’t good for just birds. I found this Eastern Red Bat (Lasiurus borealis) roosting in a tree on May 24. 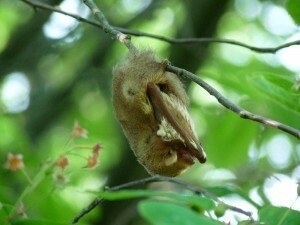 See, bats really do hang upside down. 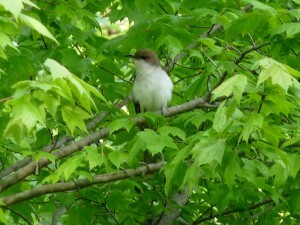 Thanks to my Facebook friends for identifying this fellow. This entry was posted in Other Wildlife, Spring Bird Reports and tagged Bats, Mammals on May 25, 2016 by rhughes. there. I hope some of the photographers got good shots of it. This entry was posted in Spring Bird Reports and tagged Warblers, Worm-eating Warbler on May 22, 2016 by rhughes.